Just as I have turned the corner on the erasable ink of the Pilot FriXion, I have really started to come around on fountain pens as well. The more I am around them, the more I want to use them. The more I use them, the more I enjoy how they write, and all the different options that are available. The Ohto Rook doesn’t fall into the category of a traditional fountain pen, but it is a fun portable fountain pen that I am very much enjoying. When I first took the pen out of the package, it took me a few seconds to realize how to open it up to write with. When capped, it measures just 3.7 inches in length, but once I figured out how to pull it apart and post the cap, it reached its full writing length of 5.6 inches, which is comparable to most standard pens. Getting it to open after that first time hasn’t been an issue. From a writing perspective, the Rook does a fantastic job. The fine iridium nib lays down a smooth, clean line, and the ink is a nice shade of black. 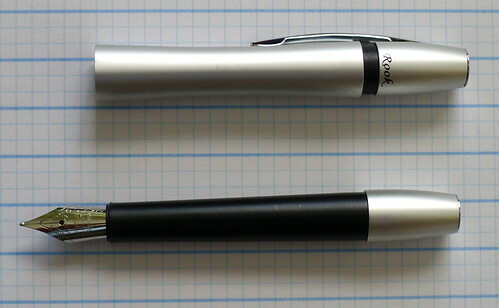 The silver portion of the barrel is made from aluminum, while the black sections are plastic, making for a very light weight pen. This is about as portable as you can get from a fountain pen. If you would like to get another perspective on the Ohto Rook, check out the review by Brian at Office Supply Geek. 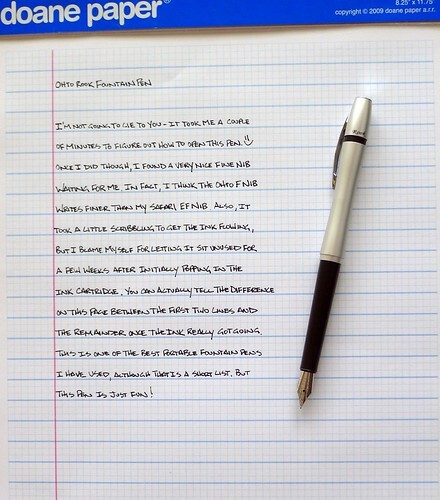 Posted on August 5, 2011 by Brad Dowdy and filed under Fountain Pens, Ohto, Pen Reviews.